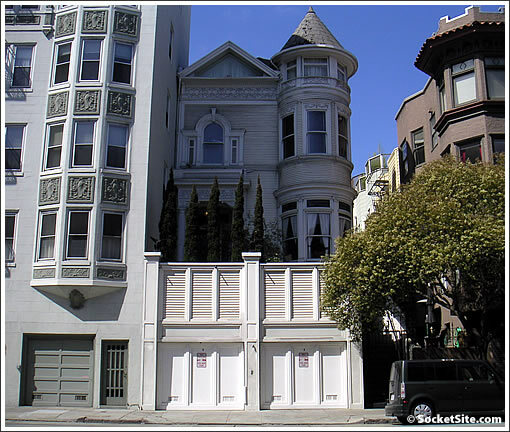 Speaking of “free” foreclosure living in San Francisco, it was a year ago that we first wrote about 1945 Franklin, the six bedroom Pacific Heights home whose previous owners have included Nicholas Cage, Howard Grossman, and Patricia Arquette. Purchased in June of 2005 for $3,000,000 by way of a $2,350,000 first mortgage and a $790,000 construction loan second (yes, that’s over 100% financed), the property was refinanced in September 2006 to the tune of $5,000,000 to which a $500,000 home equity line of credit was added three months later. Scheduled to hit the courthouse steps last September with $5,684,086 owed as of August 2009, the balance due on the $5,000,000 first was up to $6,157,795 as of this past January. And no, we don’t believe any payments have been made since. As plugged-in people know, that infamous Excalibur seen about town with “ACQUIRE” license plates currently resides in the garage (alongside a Range Rover). Once again, apparently “BorrowSpendDefault” didn’t fit nor have the same ring to it. The Pacific Heights home is currently scheduled to be un-acquired by way of the courthouse steps in two weeks. And yes, Washington Mutual underwrote the loan for 1945 Franklin as it did for 869 Alvarado. We’ll keep you plugged-in. Damn, Socketsite, you funny. I’m choking on my Wheaties here. Those are Nic Cage’s gorgeous garages out front, BTW. Does the loan only include the 2 car garage out front of can I have the house in the back also? 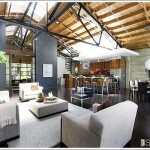 Can you tear down the old garage and build in that space or build above the old garage? He owns Hudson & Hudson, a private “boutique investment bank” that specializes in mergers and acquisitions. He said he hooks up people looking to buy or refinance a company with lenders. He charges his clients on a percentage scale based on how many millions they’re financing. There are more than a few of these cool old houses which are stuck in shadow behind the new streetfront. Seems like the ideal solution would be to slide them forward 20 feet. Heck, they used to move houses across town fifty years ago, so it should be possible. Anyone hear of such a thing happening? Wow, that took quite an unexpected turn at the end. This scam artist is proof that god exists. Okay . . . . I see that guy chilling at balboa by his car talking with the valets all the time on the weekend. Seems like a nice guy. Heck, they used to move houses across town fifty years ago, so it should be possible. Anyone hear of such a thing happening? I’ve actually always wondered about the logistics of moving these house like they did in the old days. There has to be a reference book or something on this somewhere. On Franklin, I would much rather have the house setback off the street. It is unfortunate how dark it is though. Interesting idea Alia, but in this case I don’t think it would help much. This house is on the side of Franklin that faces east. The apartment building to the left (south) would still block most of the warm midday light. And by moving the house forward, you will likely lose afternoon sun on the back side. Currently though, it does look uninviting. he pratically lives at the Balboa. the rumor i heard is that he won the lottery. obviously by rigging it. If he won the lottery, why can’t he pay his mortgage or, judging from the photo, fix his roof or paint the place? Oohhh, this one. They formerly lived in a rented house on Green Street. He introduced himself as a “Private Investment Banker”. In my book, a true SF original (yes most are TRANSPLANTS). Makes things a bit more fun. Who else are our characters of the day? Sure sounds like he won the lottery to me. $5 million or so is a big prize. He’s a personable guy, every time I walk by with my dog he says hello. He lives there with his wife and daughter. The daughter goes to private school (I always see her in a uniform) so they have to be getting money from somewhere. Judging by the contents of the garage and house, which look to be full, it doesn’t seem like they’re stressing about leaving anytime soon. I believe this home was presented in Architectural Digest in 1978.